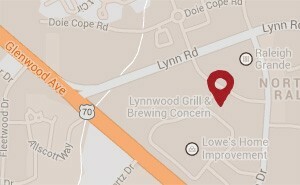 Lynnwood Grill & Brewing Concern is the result of two of Raleigh’s most traveled roads: Glenwood Avenue and Lynn Road. Our brewery and restaurant brings every side of town together to experience delicious food, fun events and house-brewed craft beer near the intersection of Lynn and Glenwood. With our friendly and comfortable environment, Lynnwood Grill & Brewing Concern will quickly become your favorite microbrewery in Northwest Raleigh. You’re sure to find something you love to eat at Lynnwood Grill, as our menu is complete with delicious pizza, sandwiches, appetizers, desserts and more. Quality is important to us, so we take extra care to use fresh ingredients, often featuring organic products. Whether you want a full meal or just drinks, our bar and grill at the intersection of Lynn and Glenwood is the perfect place. Lynnwood Brewing Concern is proud to serve our unique microbrews, including our award-winning dry stout, black IPA and more. Try all of our craft beers with a four- or six-beer flight, or take home your favorite brew in a growler. We offer great weekly specials and fair prices so that you can make LBC your regular spot and come back as often as you want. When Glenwood Avenue and Lynn Road collide, you get the best brewery on this side of Raleigh and beyond. 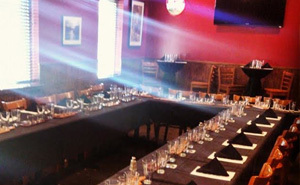 Visit Lynnwood Grill & Brewing Concern to experience our food, microbrews and fun events for yourself. Take a look at our calendar to learn more about our sports events, trivia night every Wednesday and other exciting events. There’s never a dull moment at LBC, so contact us today with your questions or to order food to-go. Located near the intersection of Glenwood Avenue and Lynn Road, Lynnwood Grill & Brewing Concern is proud to serve Northwest Raleigh residents with house-brewed craft beer, catering services, great food and more.